Other components are working OK, so is there anything special to do with this component? I can not reproduce this on a Joomla! 3.7.2. The steps below are what I did. Can you follow them and report back if this works for you? Created the Custom User-group, it is a child of the Public - I called it "users-managers". 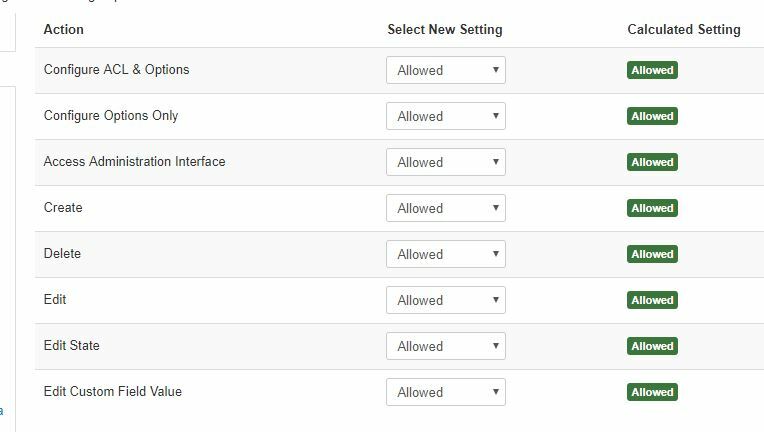 Gave full Permissions = set everything to Allowed for the new user-group, through the Options of the users component. Gave Special Viewing Access Levels for the new group. Gave only Administrator Login permissions from the Global Configuration for the new Group. If the above won't produce the expected result - then see if there is any 3rd party ACL extension installed and also if there is any custom admin menu. Not the answer you're looking for? Browse other questions tagged administrator acl user-groups permissions global-configuration or ask your own question.